This report discusses mixed-use and architecturally varied stratas and the three legislative tools that were introduced to manage legal issues surrounding them — sections, types, and phases. It also makes 68 recommendations for reform. Persons with Disabilities (PWD) Benefit Application, Appealing Denial of PWD Benefit, Persons with Persistent and Multiple Barriers to Employment (PPMB) Benefit Application, and more. The program provides legal advocacy to low income residents in Campbell River and the surrounding area. Advocates provide information, assistance and representation on issues related to BC income assistance programs (benefits, disability assistance, PWD applications & appeals), federal income related programs (CPP, OAS, GIS, EI), residential tenancy disputes (tenants’ rights, mediation, representation in dispute resolutions), and consumer debt issues. Residential Tenancy Program: Provides free legal representation to low-income people appearing before the Residential Tenancy Branch (e.g. evictions, rent increases, loss of quiet enjoyment, security deposit withheld, need for repairs, etc.). Legal Representation is contingent on volunteers’ availability for each case as well as availability based on client location. Employment Standards Program: Provides low-income employees with free legal representation before the Employment Standards Branch and/or the Employment Standards Tribunal on issues such as termination pay, vacation pay, overtime, etc. Legal representation is contingent on volunteers’ availability for each case as well as the availability of lawyers in the client’s location. Mental Health Program: Provides individuals certified under the Mental Health Act and their relatives with free summary legal advice over the phone (e.g. right to a second opinion, how to apply for a review panel hearing, procedure at review panel hearings, etc.). The Legal Advocate provides legal services to people age 55+ who are not able to access legal help due to low income or other barriers for legal issues involving residential tenancy, government benefits and debt. Help with income security including income assistance (welfare), both regular and disability benefits, CPP disability benefits, Employment Insurance (EI) benefits, and residential tenancy issues (for tenants). We provide legal information & referrals, and representation and advocacy at administrative hearings. Legal education on areas of service such as tenancy law and policy. The advocate can also be emailed at tishlakes@okadvocate.ca. The Family Support Worker works in the communities of Spuzzum, Boston Bar, Boothroyd and Oregon Jack Creek to help families, children and youth who are struggling to stay together or who just need some information or extra help. Help for families who are involved with or at risk of being involved with the Ministry of Children and Families. Provides useful information on identifying human rights discrimination and provides a walk through the formal system of filing a human rights complaint. 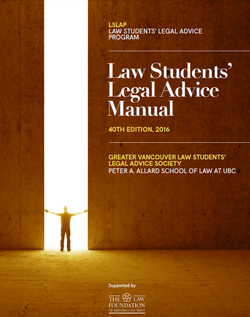 The Law Students’ Legal Advice Program’s (LSLAP) Annual Manual provides quick answers to many legal issues. It is made up of 22 chapters which amount to over 1,000 pages of printed materials. 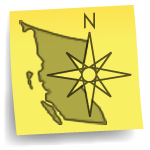 Originally designed as an educational resource for LSLAP students, it is now used by hundreds of organizations across British Columbia. Clicklaw Wikibooks and LSLAP have joined efforts to bring the Manual to the Clicklaw Wikibooks platform. This guide was designed to help with release planning (to think about what you’re going to do once you’re no longer in custody), and contains information about government services and community-based organizations in our community. Common Law Relationships: Your Income, Support, and Property Rights; What Happens When Your Spouse Dies; Reporting Suspected Child Abuse; Getting Married; Changing Your Name; What is Small Claims Court; Suing Someone in Small Claims Court; Being Sued in Small Claims Court; Getting Your Judgment Paid; and more.